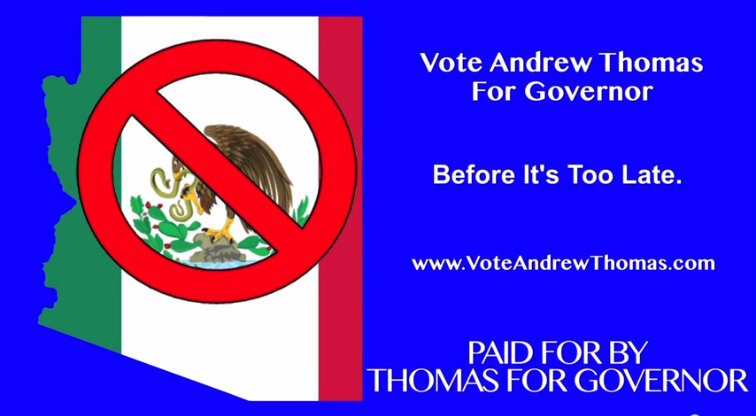 Arizona’s nutcase Andrew Thomas has launched a new campaign video, featuring Thomas himself (aka “the only candidate who stood up to the gay lobby”) vowing to take on sneaky Mexicans and banning their flag -or something like that. Filing this under the #NotTheOnion archives. This entry was posted in Immigration, Politics and tagged Andrew Thomas, Arizona, Immigration, NotTheOnion. Bookmark the permalink. Lovely! We have a similar dickhead in the UK.